Norman, E. and Bakker, K. 2005. “Drivers and Barriers of Cooperation in Transboundary Water Governance: A Case Study of Western Canada and the United States.” Report to The Walter and Duncan Gordon Foundation. A new project report has been released for the PoWG project on First Nations and the shifting water governance landscape of British Columbia, part of the SSHRC-funded WEPGN: Water Economics Policy and Governance Network. The project report by PoWG co-director Dr. Leila Harris and PoWG alumna Rosie Simms summarizes the findings of Rosie’s masters research into the shifting roles and experiences of First Nations in water governance in British Columbia. In particular, it identifies key concerns about water licensing; barriers and challenges in colonial and water governance; and opportunities and tensions surrounding collaborative watershed governance. Watersheds 2016 registration is now open! This forum offers panel sessions, field trips, breakout workshops, structured peer-to-peer learning and networking to help strengthen capacity for watershed governance in BC. Registration is now open but space is limited. We encourage you to register early, and take advantage of the reduced early-bird rate! Watersheds 2016 is co-organized by four core partners: The POLIS Project on Ecological Governance, The Canadian Freshwater Alliance, The Fraser Basin Council, and The First Nations Fisheries Council. A number of additional partners have also confirmed their support to-date including: Simon Fraser University’s Pacific Water Research Centre, the University of Victoria’s Centre for Global Studies, WWF-Canada, the Forum for Leadership on Water, Evergreen, and Water Canada. Harris, L., Kleiber, D., Goldin, J., Darkwah, A. & Morinville, C. (2016) Intersections of gender and water: comparative approaches to everyday gendered negotiations of water access in underserved areas of Accra, Ghana and Cape Town, South Africa. Journal of Gender Studies: 1-22. A large and growing body of literature suggests that women and men often have differentiated relationships to water access, uses, knowledges, governance, and experiences. From a feminist political ecology perspective, these relationships can be mediated by gendered labour practices (within the household, at the community level, or within the workplace), socio-cultural expectations (e.g. related to notions of masculinity and femininity), as well as intersectional differences (e.g. race, income, and so forth). While these relationships are complex, multiple, and vary by context, it is frequently argued that due to responsibility for domestic provision or other pathways, women may be particularly affected if water quality or access is compromised. This paper reports on a statistical evaluation of a 478 household survey conducted in underserved areas of Accra, Ghana and Cape Town, South Africa in early 2012. Interrogating our survey results in the light of the ideas of gender differentiated access, uses, knowledges, governance, and experiences of water, we open up considerations related to the context of each of our study sites, and also invite possible revisions and new directions for these debates. In particular, we are interested in the instances where differences among male and female respondents were less pronounced than expected. Highlighting these unexpected results we find it helpful to draw attention to methods – in particular we argue that a binary male–female approach is not that meaningful for the analysis, and instead, gender analysis requires some attention to intersectional differences (e.g. homeownership, employment, or age). We also make the case for the importance of combining qualitative and quantitative work to understand these relationships, as well as opening up what might be learned by more adequately exploring the resonances and tensions between these approaches. Dr Kathryn Furlong, Assistant Professor of Geography at the Université de Montréal and Program on Water Governance alumnus, has just published her new book titled ‘Leaky Governance’ with UBC Press. Congratulations Kathryn! Municipalities face important water supply challenges. These are widely attributed to local government politicization. Neoliberal reforms have only exacerbated the strained relationships between water utilities and local governments. In response, organizational reform to increase utility autonomy through alternative service delivery (ASD) has been promoted around the world. For its proponents, ASD offers independence from municipal government without relinquishing control over the utility; for its detractors, it is privatization under another name. Yet the organizational barriers offered by ASD are at best leaky. Deeply interdependent, both water management and municipal governance must be strengthened to meet contemporary water supply needs. The Wall Papers, the Peter Wall Institute’s quarterly magazine, recently published a special issue on water. 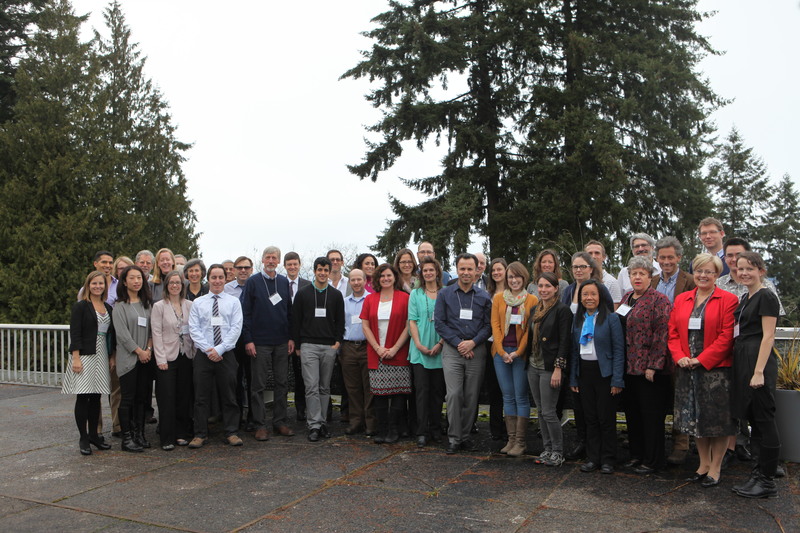 The special issue features an article titled ‘Water insecurity requires interdisciplinary solutions‘, which builds upon the recent workshop on water and innovation held at the Peter Wall Institute at UBC. In this article Dr. Karen Bakker highlights growing water security risks, and the need for interdisciplinary research to address multifaceted science and policy issues. Karen argues for a ‘regenerative sustainability’ approach to water innovation, in which solutions are targeted at leaving the environment better off than it was before. Other articles in the special issue focus on solutions to aboriginal water health issues; the effects of climate change on ocean conflict; the science of ice sheet melting; and an arts-based competition on water. Workshop video: What is healthy water? The Peter Wall Institute for Advanced Studies at The University of British Columbia (UBC) in Vancouver, Canada, recently hosted an international Exploratory Workshop on water and innovation, led by principal investigators Dr. Karen Bakker and Dr. Leila Harris from UBC’s Program on Water Governance. Further information on the outcomes of the workshop can be found in the final report on the workshop website. An interdisciplinary workshop on ‘water and innovation’ was held at the Peter Wall Institute for Advanced Research on January 29th-30th. It was attended by scholars from the humanities and social sciences, natural sciences and medicine from UBC and other North American universities. In addition, representatives of global, national and regional organizations attended, including the OECD Water Governance Program, the UN’s Advisory Board on Water and Sanitation and the BC Ministry of Technology, Innovation and Citizens’ Services. The workshop sought to explore concerns for water security from an interdisciplinary perspective, identifying potential innovative strategies and solutions. Its three key objectives were to (1) foster interdisciplinary dialogue on innovative solutions to some of our most pressing water problems; (2) identify key areas for cutting-edge interdisciplinary research on water issues; and (3) support the development of major research grant applications. The workshop was comprised of seven closed sessions held over two days, together with a public talk, which focused on interdisciplinary perspectives on water health. The closed sessions involved presentations from key scholars on contemporary water issues, global water governance, innovations in sustainability and water research, water values and innovation in the public sector. In each session, panelist presentations were followed by an open floor discussion of the ideas and questions raised by the presenters. The workshop sessions concluded with a small group strategizing session, in which groups were challenged to present proposals for innovative interdisciplinary research projects on water.